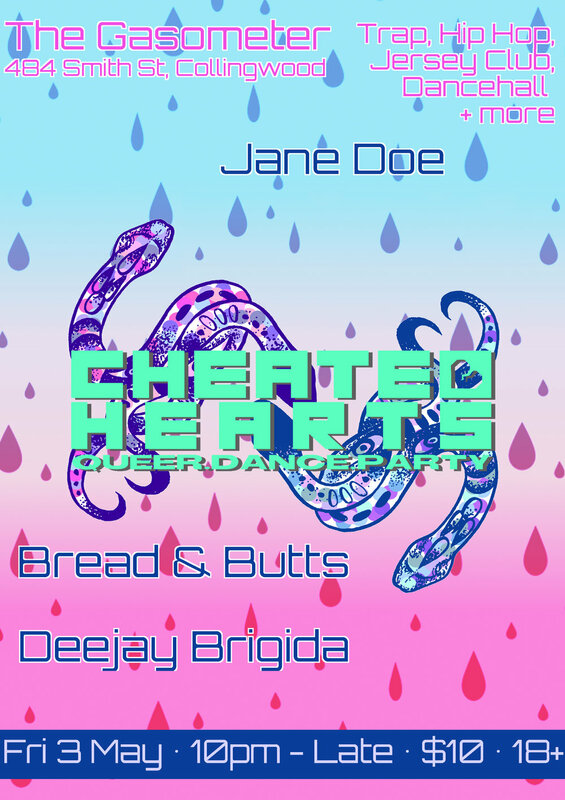 Cheated Hearts isn’t just a place to party with some of the best up-and-coming DJs on the scene, it’s a way to connect with the queer community and beyond. Aiming to coax brilliant bedroom DJs out onto the stage, CH seeks to not only prioritise newbies, but to platform LGBTIAQ+ talent and people of colour as well. The ground level of the Gasometer is wheelchair accessible with one disabled and gender neutral toilets. While in this space please be aware of yourself and others - do not touch someone without their consent. Do not use language or display behaviours that are in any way sexist, ableist, homophobic, transphobic, or racist. Please see event or venue staff if someone is making you uncomfortable. Please be aware that flashing lights will be present. We acknowledge that this event is taking place on the stolen lands of the Wurundjeri people of the Kulin nation. Sovereignty was never ceded.